Goldie is a Golden Retriever with never ending drive and full of energy. It was really fun and also exhilarating to engage with this dog for the whole month. She was overly protective when she came to me and was not housebroken. Very rare for a Golden Retriever but she had to much civil aggression. But of course the playing side of a Retriever was always there though not yet developed. As the training commenced, I noticed she was a quick learner and a fun learner as well. So as I incorporated more complicated routines into my training session, she was able catch up with a breeze and shine with flying colors. 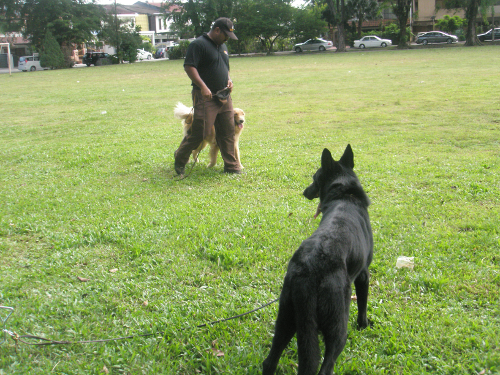 Photo gallery below show some of our handover session after the dog was trained for obedience. Video below was taken during the practicing phase with the owner. Notice how well the dog is now alert and paying the right kind of attention to follow the commands.